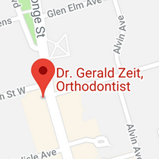 Dr. Gerald Zeit and team have been providing high quality orthodontic care to the communities of midtown Toronto for more than 30 years. We are dedicated to helping all of our patients to achieve healthy and beautiful smiles. Dr. Zeit is considerate and caring with all patients and family members. He takes a genuine interest in the outcome of each case and has a great amount of experience in the field. Patients benefit from our doctor’s passion for his work and the unique understanding he has for his patients’ situations. Our excellent team is quite involved with every aspect of treatment. They always make an effort to get to know our patients personally and work hard to try to ensure a smooth and comfortable experience. There is no high pressure sales pitch here - only a commitment to providing the highest quality orthodontic care in a safe and pleasant environment. Our goal is to treat our patients to the comfort and quality of care that we would like to receive ourselves if we were in their places. Contact our office to schedule a consultation with us today. Our friendly staff specializes in great results that will have you smiling from day one.